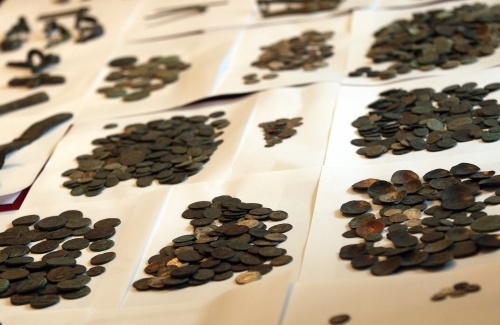 Bulgaria's criminal police have stopped the illegal sale of Bulgarian medieval coins on the internet site of an auction business registered in London. The deadline for the bids for the numismatic collection on the site of "CHG - Classical Numismatic Group, Inc" has been listed as November 10. According to the police, one of the coins is very rare – a silver penny of Despot Dobrotitsa, from a mint in Kaliakra, listed in the "Bulgarian Antique Coins from the 9th to the 15th Century Period" catalog, published in 1999 in Sofia. Eight years later, in 2007, a collection of 500 medieval crosses and 2 000 medieval coins, including the said silver penny, were stolen from the home of one of the authors of the catalog. After the joint operation between the Main Directorate "Criminal Police," the Bulgarian Culture Ministry, and the Supreme Prosecutor's Office of Cassations, the Bulgarian medieval coins have been taken off the auction site and their sale halted.